Assisted Suicide: Who Cares About Caring Anymore? You are at:Home»News»Issues»Euthanasia»Assisted Suicide: Who Cares About Caring Anymore? Last November, the Council of the District of Columbia voted 11 to 2 to legalize assisted suicide, joining six other states. Such an action will only encourage the assisted suicide/euthanasia movements throughout the country. A statute legalizing assisted suicide puts the most vulnerable people at risk. People who are sick, poor, and the elderly will be the target to be pressured into ending their lives by those who have deemed their lives unworthy to be lived. In some states, health insurance companies have declined to pay for necessary treatment, while offering to compensate those who assist others in taking someone’s life. One would be naïve to think that the costs of caring for someone, which would obviously be more expensive than the expense of assisting someone in suicide, is not a strong motivation. Assisted suicide no doubt will also lead to changes in the mental attitude of the medical profession. Instead of feeling bound by the Hippocratic Oath, to do no harm, the doctor will see his role as not one of healing but one of killing the patient. Like the assisted suicide law in other states, the D.C. law requires no accountability or transparency. Even though death is intentionally brought about, the law requires that on the death certificate the cause of death be deceptively listed as the underlying illness or disability, which in fact did not cause death. Nowhere else in medicine is this acceptable, as pointed out by Congressman Brad Wenstrup (R-OH). 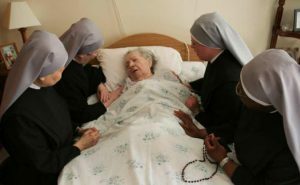 Sister Constance Veit, LSP, the communications director for the Little Sisters of the Poor, has expressed her deep concern a bout assisted suicide. This order of nuns, who although well known in their own right for caring for the elderly who do not have the financial means to care for themselves, gained national attention when they publicly refused to abide by President Obama’s HHS Mandate, that they, like all employers, must provide healthcare insurance which pays for contraception, sterilization, and abortion-inducing drugs. 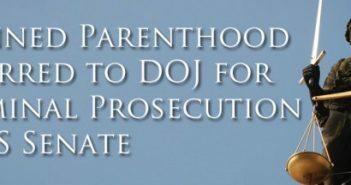 The lawsuit they filed is still pending. “No one on the Council acknowledged the reality that none of us is ever truly independent throughout life. Each of us belongs to a family and/or community. Our personal decisions are never really ours alone; they always have an impact on others, especially those closest to us. Saint John Paul II spoke of a distorted notion of freedom ‘which exalts the isolated individual in an absolute way, and gives no place to solidarity, to openness to others and service of them.’ He also wrote that suffering exists in the world in order to unleash love. This love is expressed through the sincere gift of self to those who suffer, creating a cycle of compassion and solidarity. “But what did you do to relieve your loved one’s terrible suffering?” Sister Constance continues. “How did this experience make you a better person? What did you receive from your loved one in their final days that you would not have received if they had checked out early? An outlook shaped by these questions could make all the difference because it would guide our hearts toward effective, loving responses to the terminally ill, rather than pity, condescension or apathy. Dr. Brian Callister, a physician and professor at the University of Nevada Medical School, relates how some insurance companies have denied his patients life-saving medical treatment coverage, while offering to pay for them to commit suicide. To support his assertion, he reports two incidents, one where the patient’s home state was Oregon and the other California, both of which have legalized drug-prescribed suicide. When he contacted the patients’ insurance companies, both refused to cover the patients’ treatments, though neither patient was terminally ill but would become so soon if they did not receive the necessary treatment. As reported by lifenews.com, Stephanie Packer, a young, terminally ill mother of four, stated that California’s Medicaid plan refused to pay for her medical treatment, while offering to pay for assisted suicide drugs. In another case reported by lifesitenews.com, two Oregon cancer patients, Barbara Wagner and Randy Stroup, were offered doctor-prescribed suicide by their state health insurance plans, after being denied coverage for treatment. In another reported incident, Kathryn Judson of Oregon reported that doctors tried to convince her husband, when she was not present, to consider assisted suicide. Fortunately, they switched doctors, and her husband was blessed with five more years.